Željko asked: In the zone there existed another two British colonies, the Protected Kingdom of the Mosquitos (today Miskitos), and the colony of Bay Islands (today a Honduran province). Did there exist flags for the two territories?. Both were given up before the 1864 Order-in-Council that permitted colonies to have ensigns with flag badges - Mosquito Coast in 1860 to Nicaragua and the Bay Islands in 1859 to Honduras. I wasn't aware that the Mosquito Coast was constituted as a kingdom within the British protectorate though, so it may well have had a flag. The first version was adopted 1834. The second was adopted in 1860 when the Nicaraguan flag replaced the Union Jack in the canton. The 1986 Constitution provides for the autonomy of the two Moskito Coast provinces. Source: William Crampton's "The World of Flags". 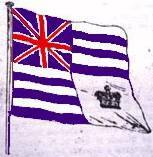 This is one of a number of inconsistent British ensigns with an 1801 Union canton that are shown in 19th century flag books/sheets. Mosquito Coast covered parts of modern Nicaragua and Honduras. Possibly had some connection with Bay Islands a dependency of Jamaica ceded to Republic of Honduras in 1859. Below there are a couple of historical flags of the Mosquito Coast, used in the 19th century. "Nations Without States" describes a similar flag in use at present as the national flag of the Moskitu people. It has 8 horizontal stripes, alternately blue and white (I assume blue uppermost, but it is not specified). The flags here appear to be based on 10 stripes. Also, the present one described in NWS has no charges or other features beyond the 8 stripes. Multiethnic indigenous party has a flag of green, white and green (1:2:1). Coastal Unity Movement (RAAN) is vertical green, white and blue, and in center is a white bordered black bird above the bird a semicircle of white bordered black stars (7 stars, two in the green, two in the black and three in the white). About this flag (1860-1893) I'm unable to discover if the 1854-? nicaraguan flag was used in this flag. I assume that, because the flag with nicaraguayan flag in canton was created in 1860, the 1854 nicaraguayan flag was push into the flag, but I found only versions in use later, when nicaraguayan de facto flag is already the B-W-B. Mosquitia was self named Togosgalpa or Tologalpa during spanish times. No spanish administrative body was present in Mosquitia. The spanish ruler Philip V decree in 1707 on the extermination of the Miskitos but this was never completed. The local paramount chief put territory under british rule. The British transfered the zone to Nicaragua 1894. In 1894 in Bluefields era, the flag of Mosquitia was desecrated by Nicaragua, and he was fired. Even if it was recognized in the treaty where United Kingdom transfered the protectorate to Nicaragua, really it was never used anymore. 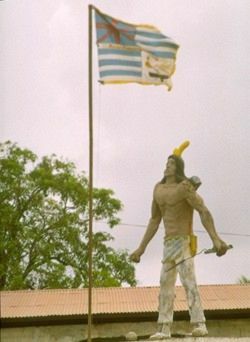 The flag of Mosquitia was recognized de facto by Violeta Chamorra when it was restored by the oldmen council on 17 Octuber 1996 (the oldmen claim to be the representative body of the Communitary Miskito Nation) and was hoisted for 7 monthes but it was forbidden by the rightist Arnaldo Aleman after he won the elections. In 10 January Aleman anounced that the flag is forbidden as separatist. Later he traveled to Mosquitia. The flag was last hoisted on 4 May 1997, the day of the arrival of Aleman, that ordered of its lowering from the Central Park of Puerto Cabezas, the most representative place where it was hoisted. During its short reaparence the flag was hoisted in Bilwi, Waspám, Sisín, Kum, Francia Sirpi and la Esperanza. The flag bear the british flag in canton, but, in front of the attacks of Nicaraguayan, the oldmen council explained that this is their historical flag and not a pro-british flag as assumed by european originated people. This would appear to have been a local agreement which was not officially recognised. The only British colony in the area, other than British Honduras (Belize) was Bay Islands off the coast of Honduras. They were occupied by Britain in 1839, annexed as a dependency of Jamaica in 1852 and ceded to the Republic of Honduras in 1859. I presume that the territory said to have been transferred to Nicaragua was associated with Greytown (now known as San Juan del Norte) where Britain maintained a consul ? Mosquito Coast was, I think, another name for the Bay Islands, which were occupied by Britain in 1839 and ceded to the Republic of Honduras in 1859. The Mosquito Coast was in the same general area as the Bay Islands, but they were not identical. The Mosquito Coast occupied what is now the Caribbean coast line of Nicaragua. A map of it can be seen at <www.zum.de>. That site says a virtual British protectorate was established there in 1848, but in this page, there are flags with Union Jack cantons prior to that date, so there was probably some sort of even more informal connection prior to 1848. Since that site describes it as a "virtual" protectorate it might be inferred that the relationship was never formally ratified or recognized? In any case, whatever the official nature of the relationship, Britain transferred its protectorate (such as it was) to Nicaragua in 1860, which formally annexed the Mosquito Coast in 1894, ending its status as a distinct entity. Mosquito Coast was the name the eastern coast of Nicaragua had (and still has) and that today is, I believe, a province with some autonomy due to cultural specificities. The capital is named Bluefields and it includes a group of islands in the Caribbean, called "Cayos Miskitos". I read an article on the BBC News website titled: "Nicaragua's Miskitos seek independence. "La bandera que de ahora en adelante debe, según el Consejo de Ancianos, prevalecer en La Mosquitia es verde y con un indio en medio, un sol y luna a los lados, además de dos estrellas." (The flag that should from now on prevail in Mosquitia, according to the Council of Elders, is green with an Indian at the centre, a sun and a moon on the sides, in addition to two stars). Oddly enough, <www.puebloindio.org> does discuss the flag but does not show any picture. While looking for more information on the Miskito flag, I came across this unusual UJ-ensign styled flag at <www.geocities.com>. It appears to be the same as the royal standard, but in rectangular format. The newspaper article on the BBC News refers to the city of Puerto Cabezas called "Bilwi" in Miskito (Moskitia language). Puerto Cabezas is located in the Región Autónoma del Atlántico Norte in the territory known as Mosquitia (spelled also Moskitia), which is actually the Costa de Mosquitos (Mosquito Coast). The newspaper article refers to the local form of natives people's government, called the Communitarian Nation of Moskitia (see wikipedia): "The Wihta Tara, Grand Judge, Héctor Williams, together with the Advisor to the Council of Elders, Oscar Hodgson, visited Bluefields and Rama Cay to gather with several local sectors seeking their support for the Declaration of Independence of the territory of La Mosquitia from Nicaragua". This separatist remarks were first endorsed and stimulated, as the newspaper article states, by the Fsln guerrilla prior to their taking of power in 1979 as a way to seek the support for its leader Daniel Ortega, to organize the indigenous communities under the leadership of a Fsln cadre (Steadman Fagoth), but once the indigenous people backed away from this offer, the Fsln retired from their deal. The questions about the crosses being joined in the royal standard of Moskitia, reported correctly by Jaume Ollé, is answered definitively by the photograph of it taken in the Central Park in Bilwi (PuertoCabezas) in 1997 seen at <members.cox.net>. The Miskitos consider it their traditional flag and were outraged by the order of ex-president Alemán to take it down during his visit to Bilwi on May 4, 1997 (as described by Jaume). The flag appears to be rectangular. Jaume mentions also other flags used by the Miskitos, but this is very poorly documented on the internet, if at all. 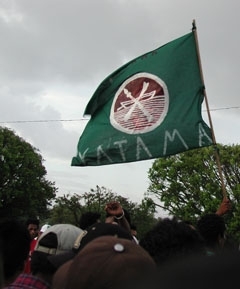 The flag of the political party YATAMA, described by Jaume, can be seen at: <upsidedownworld.org> with the detailed info on the organization and in another photo at: <www.grupoese.com.ni>. The central charge of that flag is identical to the emblem of the Communitarian Nation of Moskitia as seen at: <www.puebloindio.org>, but not in colors (note that .site is outdated and not kept up to date, so the emblem might be obsolete). The report of the flag of the Communitarian Nation of Moskitia, describes the flag, supposedly adopted after the declaration of independence by the "Almuk nuni" (Elders Council) on April 18, 2009 (really re-declared, as the original declaration of independence was issued in 2002 already). This flag is described as: "The flag that from now on must, according to the Council of Elders, prevail in the Mosquitia is green and with an Indian in the middle, a sun and moon on the sides, in addition to two stars". There is no image of this flag made available on the net yet. The Indian mentioned in that report might be looking like that. For comprehensive history see: <www.answers.com>. - a circular seal in the center, probably with an Indian in the middle (hard to say what he looks like exactly, if it is a face as on the link reported above, if it has somehting to do with the Elders council symbol seen at or if it is a different drawing). - an orange little sun on the right side. The whole flag cannot be seen but on can think the green border occupies the 4 sides of the flag, hence the description as a "green" flag. I found the coat of arms of the Mosquito Coast from 1860 in the Government of the Nación Comunitaria Moskitia, which they still use as their current coat of arms and also found two different flags although very similar that they use and the seal of the council of elders. The flag above for 1834 is not quite correct. The last quarter, bottom right, should be plain white with a crown in the centre as in the image. The source is "Mosquito, Nicaragua and Costa Rica". Second Edition. Effingham Wilson, Royal Exchange, London, 1849. The standard appears in colour on the title page. Unfortunately the author is anonymous. What is the source for this image? And it would be more convincing if it didn't have the common error of joining up the two red crosses of the UJ. This standard was designed by the British consul Patrick Walker to be used in the coronation of the king George in 1845. Sources: Mc Meekin, Flags of Mosquitia, Poyais and Araucania FB XVIII:2 (image page 53, text related pages 52 to 65) that quote the source for this flag: "Mosquito, Nicaragua and Costa Rica" (image in the cover) and undated and anonymous book a copy of which is in the British Library, published in London about 1850. Jaume's message has sources, but it remains, IMHO, dubious for the reason I cited in response to the first message: the UJ has its red crosses meeting. I simply do not believe that (in this form, at least) it "was designed by the British consul". It is strange undeed, but all the construction is strange. British consul in this remote zone was not a heralidst or vexilologist, and perhaps he found too difficult to made the UJ as had to be (specially in square form) and simplified the design. Notice that even in W. Smith FTTAW the UJ is slighty wrong. Or perhaps this image is taken from the published one in 1850 that was not absolutely in agreement with the real one. No. 602 - King of the Mosquito Coast (1852).